So the big holiday season is coming up. What are you going to do to blow your sales through the roof? Here are a few tips for the holiday season to get you ready for your biggest sales month of the year. Decorate the salon tastefully and not too much. Stick to a non-religious theme. Keep the display area well lit. Keep the holiday season music to a minimum. People get a little sick of it after a while. Keep plenty of fresh hot chocolate, tea and coffee on hand. If you can, invest in water bottles with your company logo on it. Buyers get hot and thirsty when they are shopping. If you can, keep them in your space a little longer. 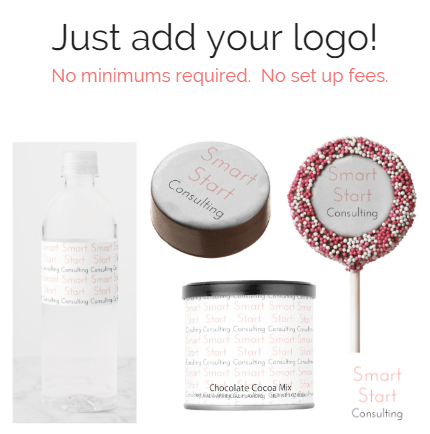 Did you know you can get hot chocolate, cookies, water bottle labels, cake pops and treats with your own logo on it? Have a coat rack near buy so clients don’t get overheated. Should you have a party? You can have a little party to celebrate the season but chances are your clients might be a little partied out. It’s a busy season. Putting all your resources into one night is a little risky. Why not host a month-long event leading up to Christmas. This way you can test out how to boost holidays sales in your salon or spa. By doing this over time you’ll be able to work out what works and what doesn’t work in your business. Ensure your staff is well trained on what promotions you are offering and ask them to mention it to clients they are working on. 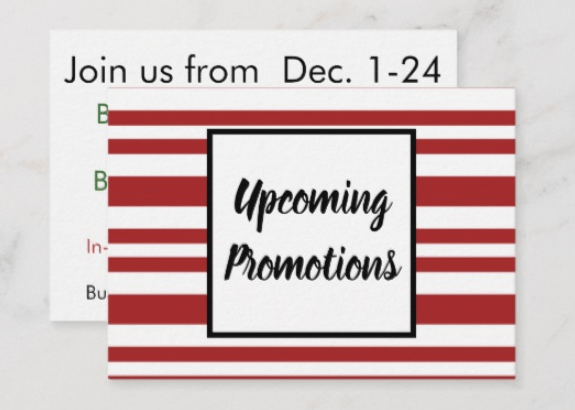 Have business cards with a list of promotions coming up and give one to every client and staple them to every receipt. If you are solo or have a small spa and don’t have a receptionist consider booking a few extra blank time slots during your day to spend time with clients selling them retail or gift certificates. One of the easiest ways to get the word out about your promotions is your email list! Send out an email blast to your client list with all of the promotions you will be running that month. Use targeted ads on facebook and twitter with your promotions. Create an event page on facebook and ask friends and family to share it. Put together little gift baskets in a variety of themes and price points. Have plenty of under $5 items right next to the till to upsell. Hole punch a hole in the gift certificates and tie a ribbon around it to hang on the tree. 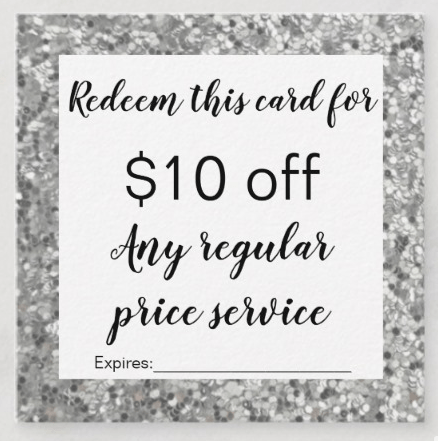 For my top 10 clients (clients who spend The most on services and retail or refer the most people to me) I give them unlimited amounts of $10 promo cards (Valid off full priced service but not to be used with any other discount) to hand out to friends and family. I make them valid during a slow month. Tell your gift giver ” Your such an awesome client! Thank you so much for helping me grow my business! Here are 10, $10 off promo codes to give to some of your friends! (point to the valid from part of the coupon) Make sure to tell them to call the salon and book it. Because it is valid only during this time. And keep one for yourself to use! Send out an email reminding clients about your holiday hours. Include a link to the online gift certificate retailer. Enlist the help of staff and friends to share your holiday promotions online. Keep plenty of snacks and refreshments on hand for your self and staff. Good luck this holiday season!